Kozhukattai is always prepared using rice or rice flour. But in villages it prepared using millets also. 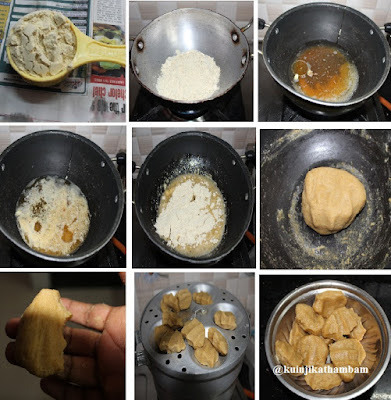 This foxtail millet kozhukattai recipe is also a village recipe (from my great grand mother). Preparation Time: 10 mins | Cooking Time: 15 mins | Yields: 10 nos. 1. Dry roast the foxtail millet flour till nice aroma comes out. Allow it to cool down completely and keep it aside. 1. In a heavy bottomed pan, add water, oil and cardamom powder. Bring this to boil. 2. Then add the jaggery syrup and grated coconut. Mix them well and keep the flame at low (simmer). 3. Now add the foxtail millet flour and mix them well. Mix it continuously to avoid forming lumps. At one stage you can get soft and pliable dough like chapathi dough. Now switch off the flame and keep it aside for cool down. 4. Then you can divide the dough into small lemon size balls. Place the ball in your palm and press using your fingers (just close your fingers tightly). Do it for all the balls. 5. Steam cook the kozhukattai using idli pot for 15 mins or till they turn into glassy look at medium flame. Allow it to cool down and then serve. 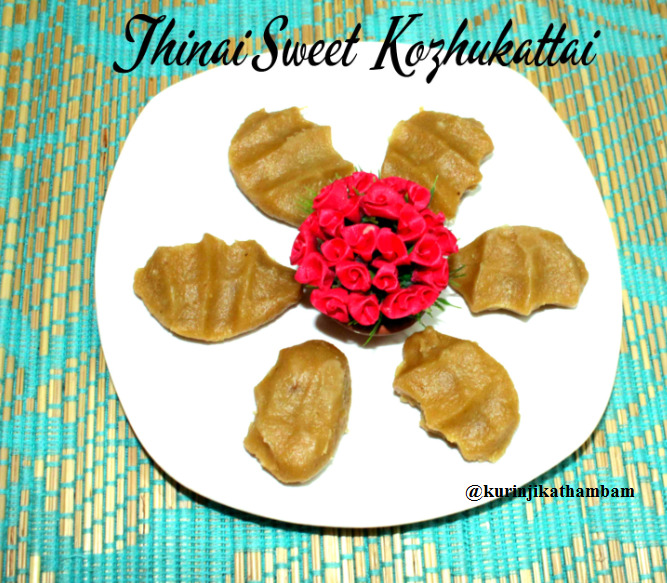 Tasty and healthy kozhukattai is ready for Neivediyam. 1.You can use small coconut pieces instead of grated coconut.